Hello friends! 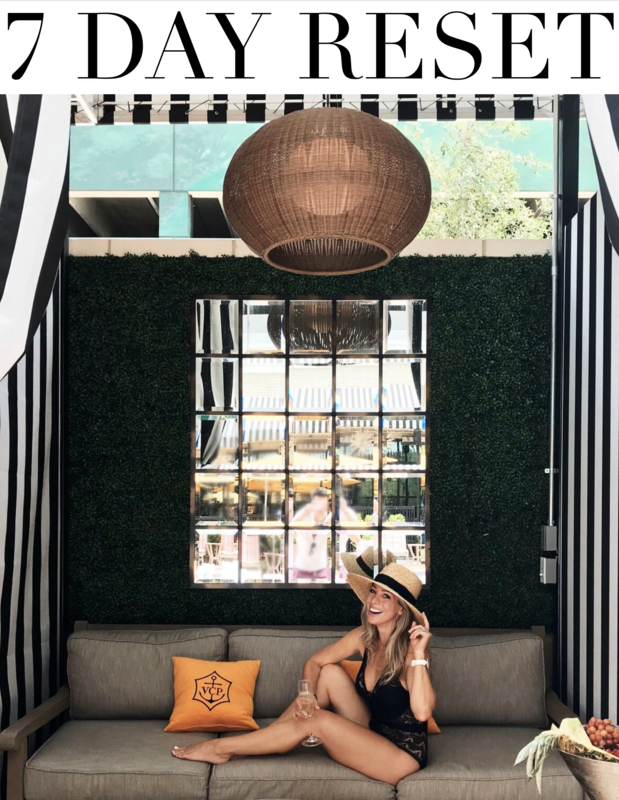 Did you have a great weekend? With Thanksgiving, it felt like Sunday was an extra day of weekend, and I’m all about that! I needed that day to catch up on life- all the laundry, grocery shopping, cleaning, etc. And I even made it to the gym on Saturday, and it felt good to get moving after eating so much! Any of you feeling the same way?? Although I almost wanted to throw our Christmas tree out the front door because it had so many burned out lights and lost a ton of the flock that I added to it last year, after stringing a boatload of more lights and decorating her up with all kinds of festive red things- I’d say she’s a sight! So glad we stuck it out! 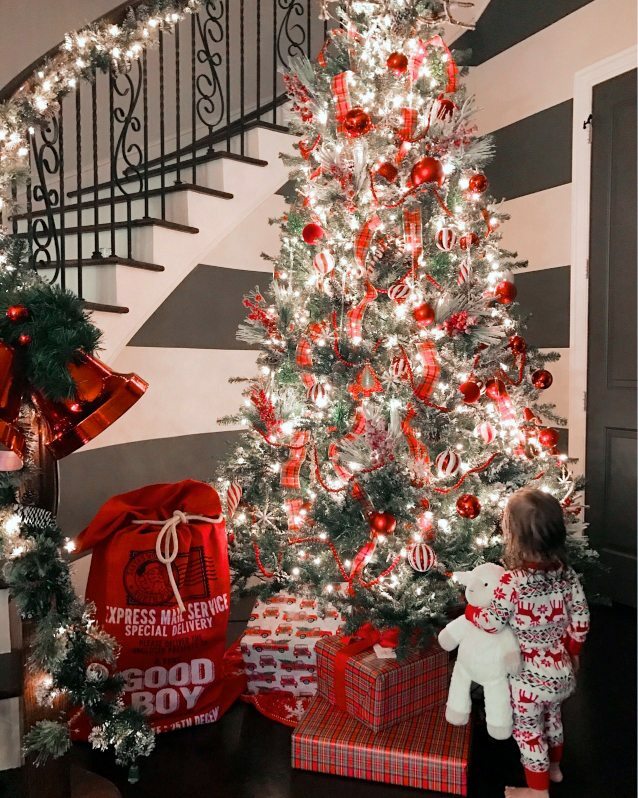 Jordan is just mesmerized by all the lights and shiny balls on the tree and the other morning I caught her just admiring it and for the first time, I heard her say, “pretty!” My heart about melted! I love Christmas so much, but part of the reason why is because it means to much to the kids. I never want to outgrow that Christmas spirit! And with Christmas comes the Christmas gift giving and sales, today being the biggest of them all! And the kind I like best- where you sit your arse on the couch and shop from the comfort of your jammies!! I’m actually writing this post on Sunday night and most of the Cyber Monday sales are already live, so I’m gonna publish this post now and I’ll update it in the morning with any new sale info! Now’s the season for all things fair isle inspired and I dig the twist on this sweater with the bright pop of pink. The tie back is just too cute! 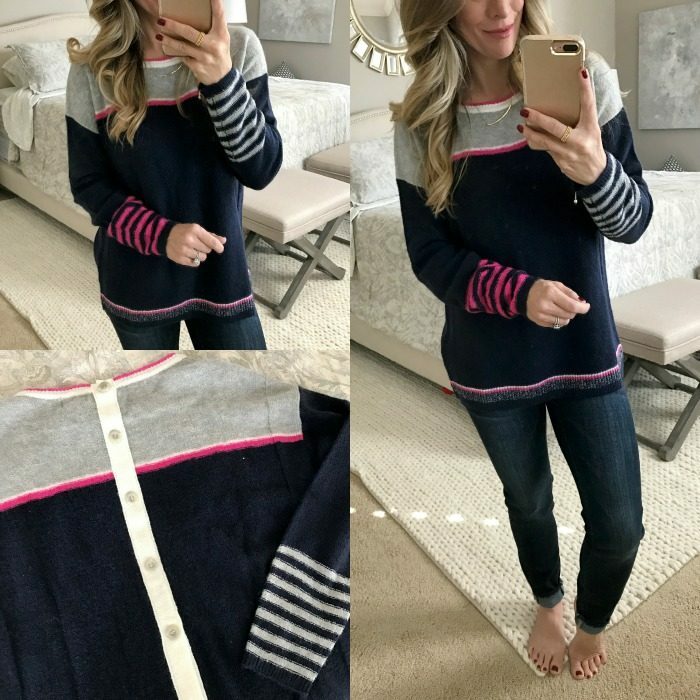 Similarly, this button-back sweater features that same pop of pink, but in a bit more subdued way with lots more navy. But what about those striped sleeves?! 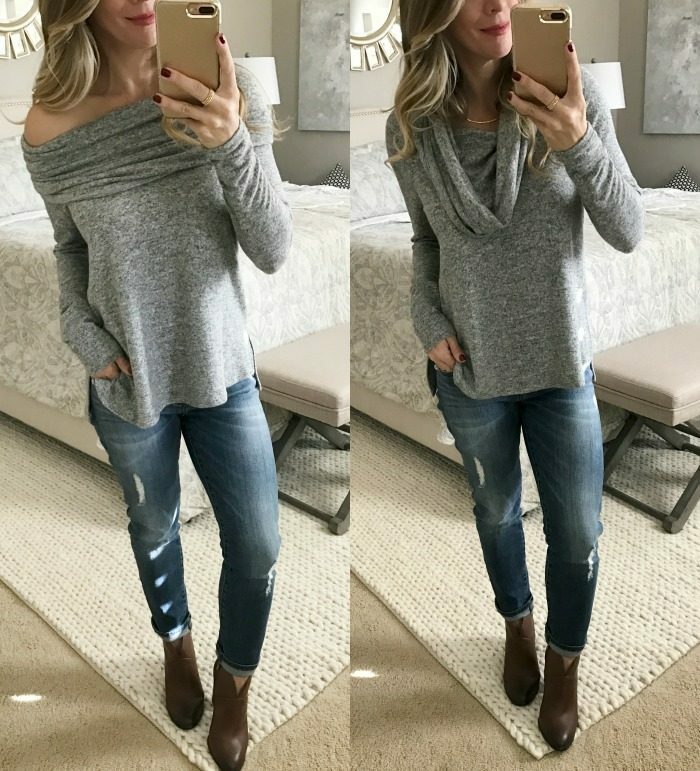 I’m also crazy for this neutral cowl neck sweater and the rib detail on the sleeves. I feel like that just makes it a classic! 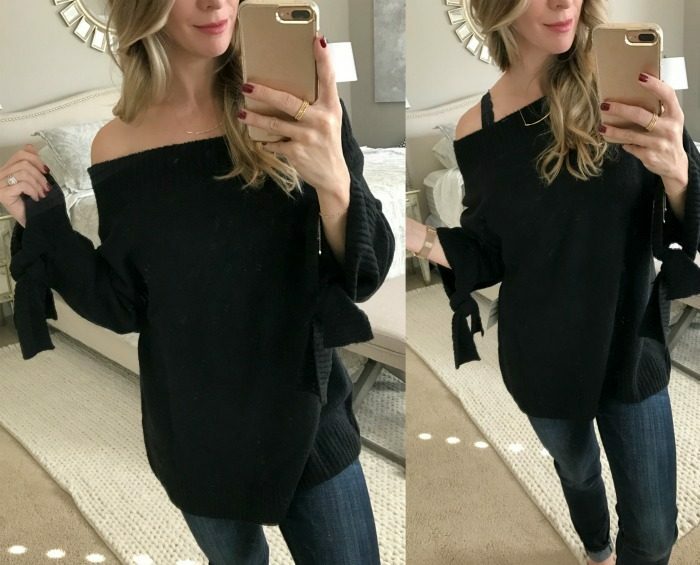 I like how you can wear this sweater on or off the shoulder with either a strapless bra (hidden) or a lacey bralette exposed. It’s not quite long enough to wear with leggings, but will happily go with jeans and tall boots! 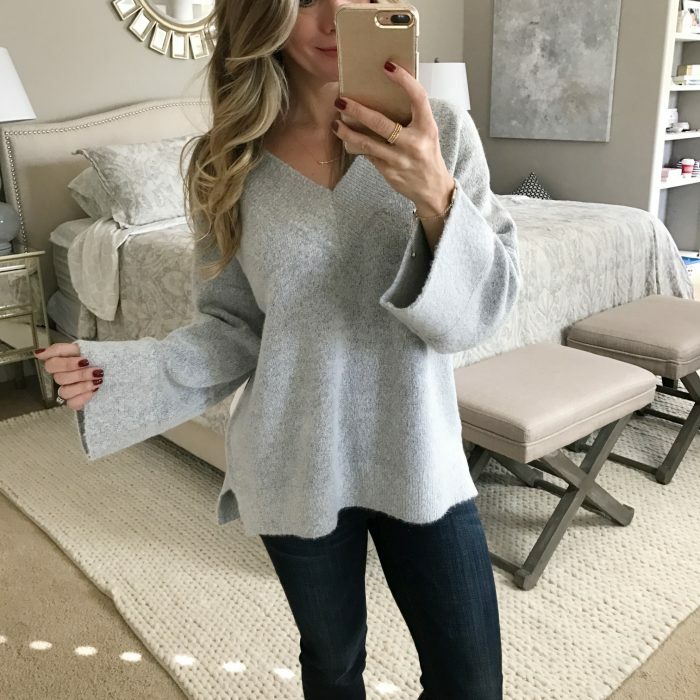 The colors in this ruffle sleeve sweater and the sweater below will go well with all the denim in your closet- from blue to grey to black and white. I didn’t realize it when I ordered this one, but it has a little bit of wool in it, which means I have to return it. If that doesn’t bother you, you’ll love this sweater! 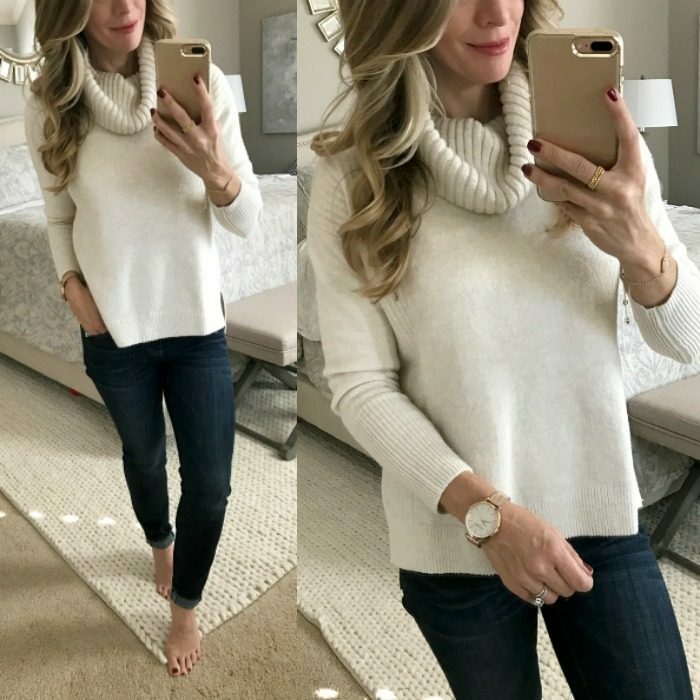 This cable knit sweater is exactly the kind of slouchy sweater I love to wear when it gets chilly out. Bring on all the cold weather! 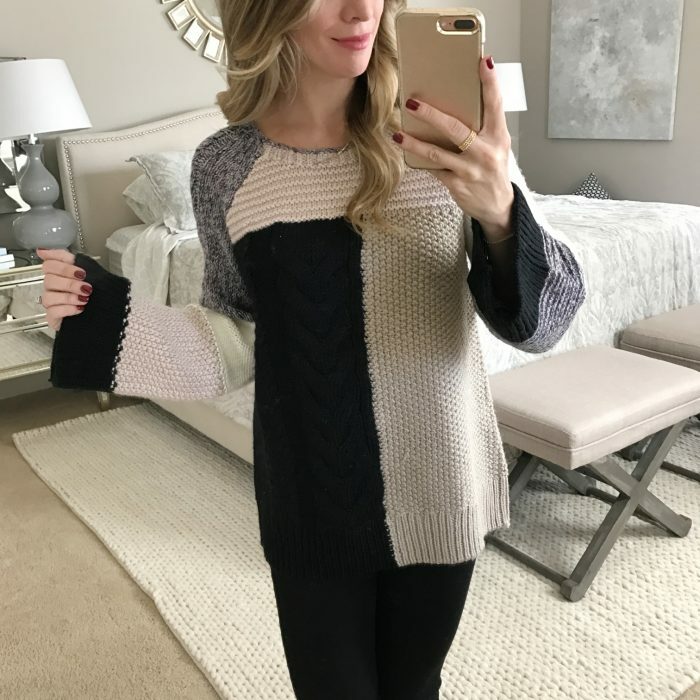 Can you see the pale pink in the sweater?! #swoon! This sweet scallop cami is under $30 and comes in black too, but sizes going quick. Fits TTS. 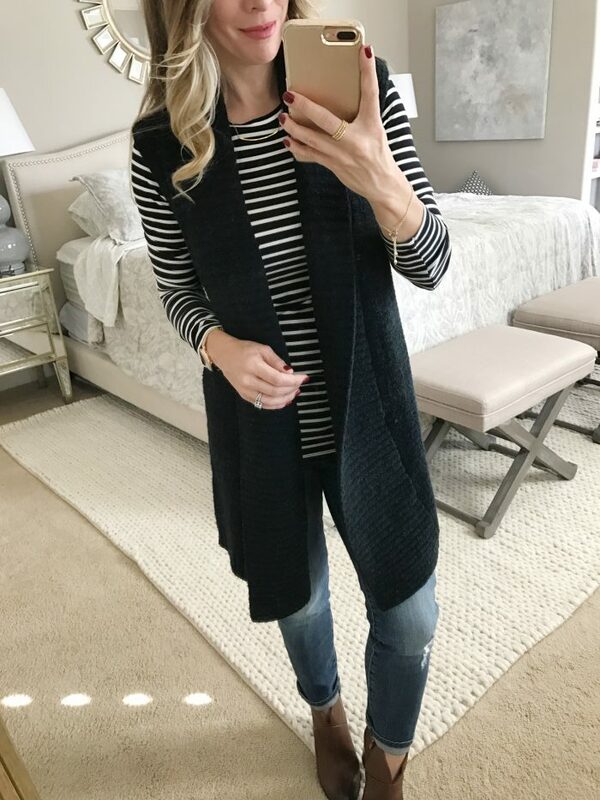 The cardigan is so cozy with pockets and under $50! 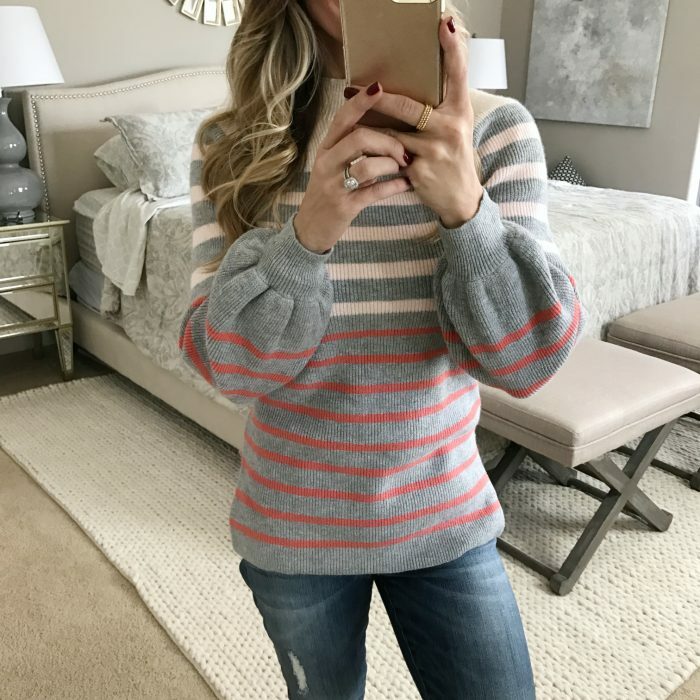 How fun are the bubble sleeves on this striped sweater?! Really cute! You can tuck it in our leave it out like I did here. 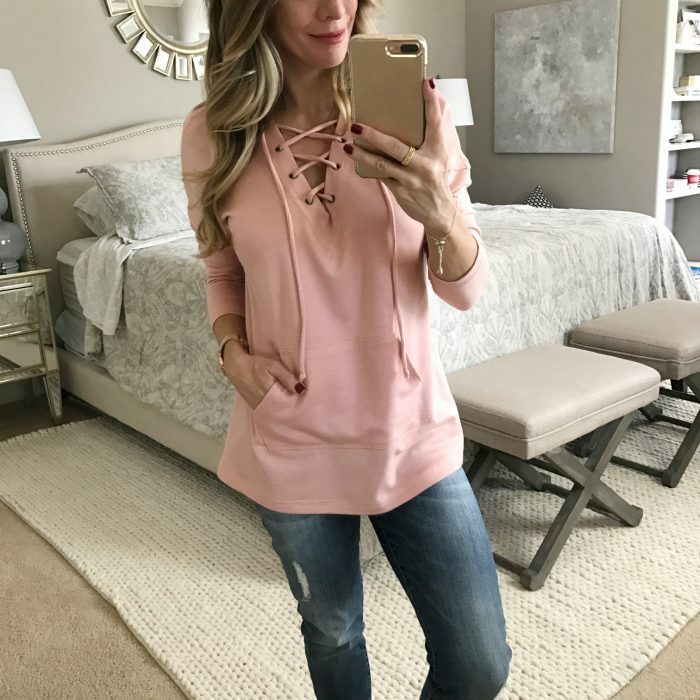 I actually ended up wearing this lace-up sweatshirt on Thanksgiving and was comfy all day. You can’t tell it here, but it’s actually a hoodie, which makes me want to wear it running weekend errands too. I’m love it when I find a long cardigan that isn’t too long for a short girl! This one is actually dark green, which I love for a change! 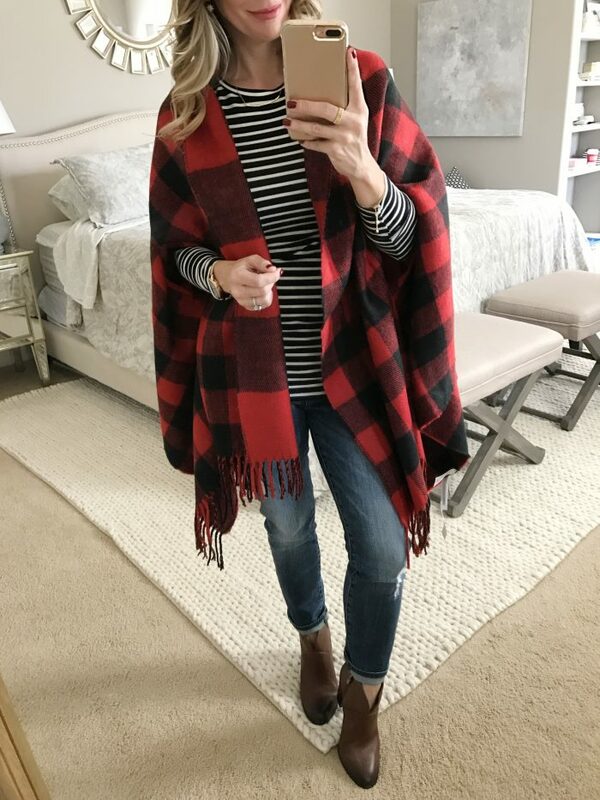 Although this poncho is One Size, I found it fit me fine! I want to take this to chilly football games and be all kinds of cozy! The armholes keep your hands free and not tangled up in a mass of fabric! Good for enjoying your hot cocoa! I found two dresses worth sharing now that are both work and party friendly. This stripe short sleeve dress is demure enough for the office, but could also be dressed up for a night out. And I was happy to see everyone’s favorite shirt dress back in stock and in several more gorgeous colors. 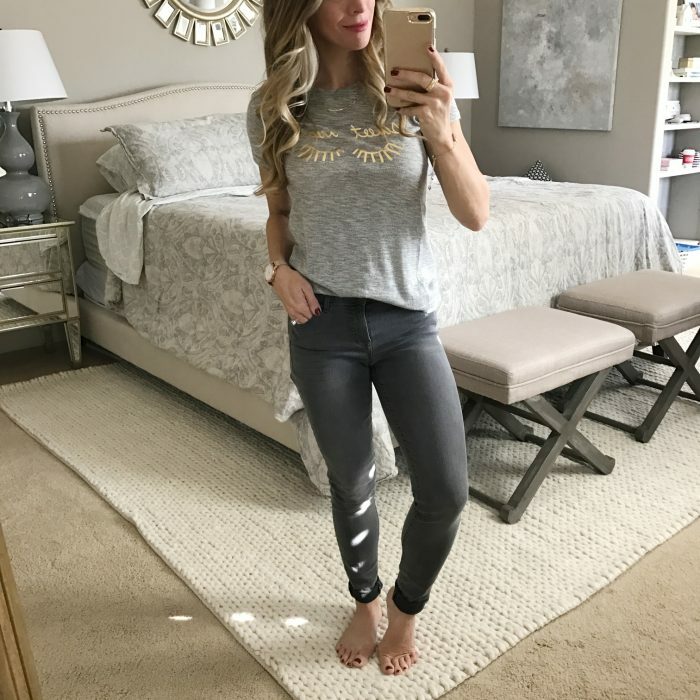 It’s under $50 and would be really cute with a jean jacket and sneaks! I’m all about the Christmas pajamas and found this shorts set that says “Merry Kissmas”! Cute, right?! And for something warmer, this flannel set is ultra cozy. I’ve been wearing this pair nonstop! 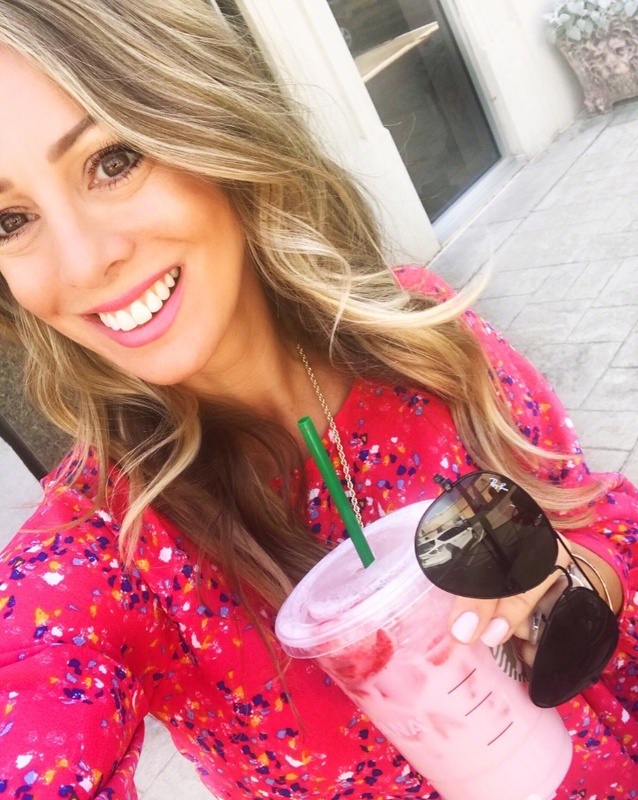 Okay, so now onto the . . . .
*If you’re reading this post in a blog reader or email, you’ll need to visit my blog directly to view the shoppable widgets I created for you! 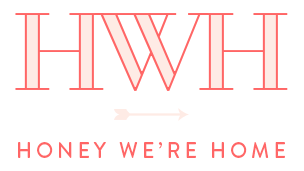 I’m definitely shopping for Toys, Kitchen, & Home things here. #BecausePrime Enough said! Instant Pot – this might be the answer to my dinner dreams- it’s a pressure cooker (think fast! ), slow cooker, rice cooker, steamer, saute, yogurt maker (? ?, but, okay! ), and warmer. 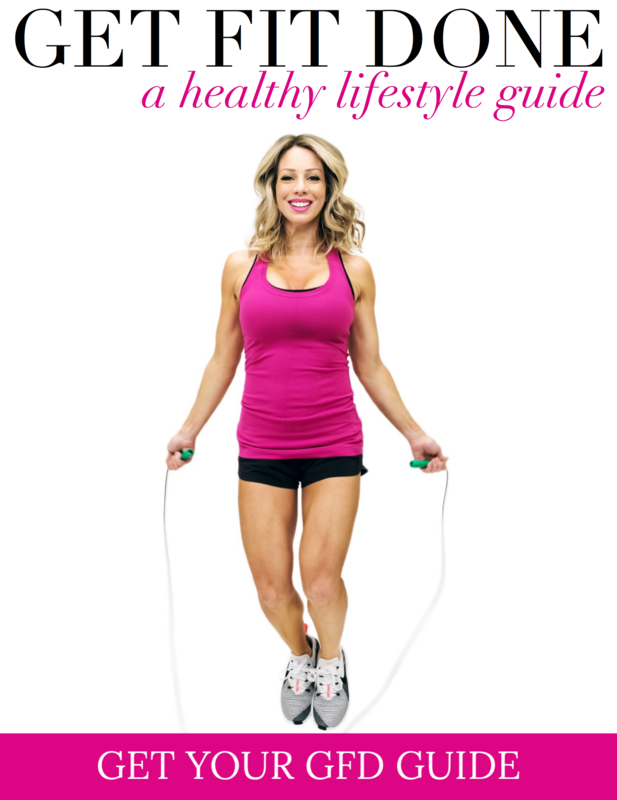 My friends have been raving about it and I’m sure I need this in my life! #oneforme! Marble Mortar & Pestle – for your foodie friend who likes to grind her own spices and grains, pastes and tapenades, she’ll love this gorgeous marble. Fire HD Kids Tablet – Up to $144 in savings on Fire HD 8 tablet, 1 year of Amazon FreeTime Unlimited, and a kid-proof case, plus a 2-year guarantee. Cannot beat this electronic babysitter deal! Xbox One – Bundle includes: Xbox One S 500GB Console, 1 Xbox Wireless Controller (with 3.5mm headset jack), HDMI cable (4K Capable), AC Power cable, 14-day Xbox Live Gold Trial. Echo Dot – Echo Dot (2nd Generation) is a hands-free, voice-controlled device that uses Alexa to play music, control smart home devices, make calls, send and receive messages, provide information, read the news, set alarms, read audiobooks from Audible, control Amazon Video on Fire TV, and more. My friend Angela loves hers and got this one for her 2nd grader. Sprocket Photo Printer – have a million darling photos on your phone you want to print? This little genius bit of technology lets you wirelessly print 2×3 inch photos from your phone! Ultimate Ears Boom – wireless speaker, great gift for the guys in your life. But we have something similar and love to play music from it in the living room #danceparty or take it to hotels when we travel. Ring Doorbell – You can check into your property anytime from your phone, tablet or PC and get instant alerts when people ring your bell or trigger the motion sensor. My friend Ali-Shaun recommended this and I think it’s genius! T-Fal 14-Piece Cookware Set – Non-stick, dishwasher and oven safe, cookware set if yours have seen better days. My widget wasn’t working on this one, but soooo many gorgeous jewels! If you buy a gift set, you can break it into multiple gifts! I’ve tried other products in the past, but keep coming back to these. I super love the Age Renewal Super Serum, Clarifying Detox Mask and Face Oil. Holiday bra wardrobe sale on select 2-3-4 bra wardrobes! If you want to add a “pretty bra” to your collection, this lacy one or this satin demi will have you smiling on the inside! 😉 And the lace t-shirt bra is a gorgeous everyday bra! Save $30 (vs reg. $15) on 2-bra wardrobe. Save $50 (vs reg. $25) on 3-bra wardrobes. Save $70 (vs reg. $50) on 4-bra wardrobes. I hope you’re having a wonderful start to the holiday season and scoring some great deals today! I’m off to do some damage saving of my own! Have a great day, friends! Previous Post The Best Things on Black Friday Sale! Making yogurt in my Instant Pot is my favorite thing to make in it! It’s so easy and yummy! Seriously?! Both my kids eat so much yogurt- I’m super intrigued by that!! Do you have a certain recipe you recommend?